From 4pm Saturday September 7, 2019 through 2pm Saturday September 14, 2019. Attending this sesshin part-time is acceptable with early departures planned for 4:00 pm Monday or Tuesday. Contact the sesshin registrar (see form below) to negotiate details of part-time attendance. All participants should arrive at Mt. Lamp Practice Center on Saturday by 4pm. An informal meal will be offered at 5pm with orientation beginning at 6:30pm. Sesshin will conclude with an informal meal around noon on the following Saturday, followed by clean-up. Participants are expected to help with clean-up and shouldn’t plan to leave until 2pm. Payment is due in full upon registration to reserve space. This will be refunded in full if cancellation is received three weeks prior to start. Within three weeks, $50 cancellation fee applies. If you register and begin to have doubts or second thoughts, please arrange to speak with Jack before cancelling. Payment plans and scholarships may be arranged with the registrar (see below). All payments must be in US currency. All meals are included in the sesshin fee. Meals are vegetarian including milk, eggs, and cheese. If you have a medically prescribed diet or needs, please advise the registrar below. Bring Zafus and zabutons are provided, though you may bring your own support cushions and bench. Bring clothes for sitting (unpatterned, dark) and for work (inside and out; including footwear); sleeping bag (tent, if camping) or bedding with pillow; towel and personal toiletries (soap, shampoo, toothpaste, etc.). Optional: raincoat, umbrella, insect repellant, alarm clock, earplugs (for light sleepers), flashlight. Cell phones & other electronic devices aren’t necessary, and there is neither wi-fi nor cellular connection available. 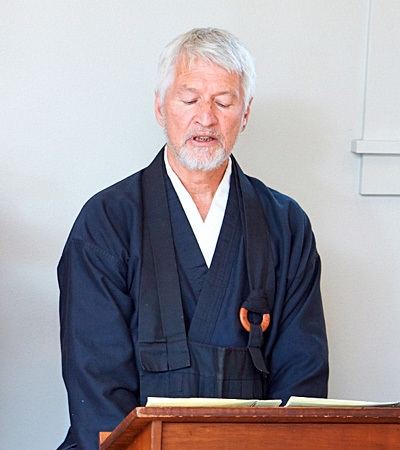 Register online or print and mail this form with your check in USD for full sesshin fee (payable to Three Treasures Sangha) by August 17, 2019 to Jan Mikus, 1614 26th Circle, Anacortes, WA 98221 (janmikus@comcast.net/206-524-0806). Paypal payment options will be presented after submitting the form.